It's a just a week until Easter and most of us are thinking about a little chocolate and perhaps a gift that lasts beyond Easter morning. 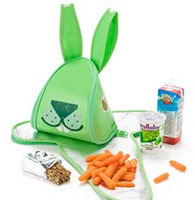 For kids, how about a green rabbit insulated lunch bag, little yellow chick purse or an adorable keepsake bunny sculpture that's individually signed by its Canadian artist? We also spotted this fantastic recipe on Vitamin Daily to keep the little ones busy - and happy - and had to share it. A friend has a book filled with loads of recipes where you can squeeze in different veggies to make sure the kids are getting all the nutrients they should. This is a cupcake recipe like that - and it sounds yummy! It's definitely made it onto our next-rainy-day-must-try list. Boil beets until soft and then place in blender and pulse until smooth puree forms. In a mixing bowl, cream ¾ cup butter and brown sugar. Add eggs, mix well. Melt chocolate with remaining butter, stir until smooth. Cool slightly. Blend chocolate mixture, beets and vanilla into the creamed mixture (it will appear separated). Combine flour, baking soda and salt, add to the creamed mixture. Line muffin tins with cupcake papers and fill ¾ full. Bake at 375 F for 30 minutes. Use a simple butter cream icing but cream cheese icing would also be delicious. 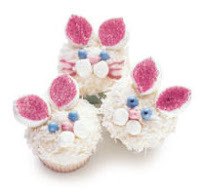 To make a bunny face simply sprinkle coconut over the icing, cut large marshmallows in half and decorate with pink sprinkles for ears, and use little candies to create the eyes, nose and cheeks. For more great Easter gift ideas, visit our online boutique Lavish & Lime.